2016 was a breakthrough year for SunFunder. Just before the end of the year, we completed our ninety-first debt financing for the solar companies delivering energy access around the world. This meant 2.7 million people will have been directly impacted by our loans, and 222,000 tons of CO2e emissions mitigated annually – the equivalent of taking 50,000 cars off US roads each year. We grew our business three-fold, both in terms of the financing we have provided to customers and the debt funds we have raised to do so. We also grew to 22 people – and now have in place the backbone of our team to scale our business many times over. 2016 was also a year of firsts. We closed our first structured receivables finance and commercial-scale solar transactions, as well as our first major loans in West Africa and India – all areas of huge potential. We also completed the first close of our $50 million Beyond The Grid Fund, anchored by OPIC, the US’s development finance institution. This shows us a pathway for our next stages of scale. In 2016, we said a final goodbye to our crowdfunding operations, which got us started five years ago. In 2017, we will launch new lending products and debt funds to keep pace with demand. The emerging market solar sector has never been more dynamic. Over 2 billion people still live without access to reliable energy, while the economics of solar continue to improve. The lack of available debt finance remains a key bottleneck, and the need for financial intermediaries has never been more important. SunFunder is uniquely positioned to thrive in this role. To all our customers, investors and friends, we would like to say thank you – and here’s to continuing to build the beyond the grid solar sector together in 2017. SunFunder’s Lais Lona accepts the Ashden International Gold Award in June 2016. Click for video profile. SunFunder has financed more companies in the off-grid and grid deficit solar sectors than any other investor. Our portfolio of solar loans nearly tripled in 2016. This matches the growth of the sector as a whole – with businesses rising to meet the scale of the challenge. The most active market remains East Africa, but we have also completed loans in West and Southern Africa, as well as India and other countries. 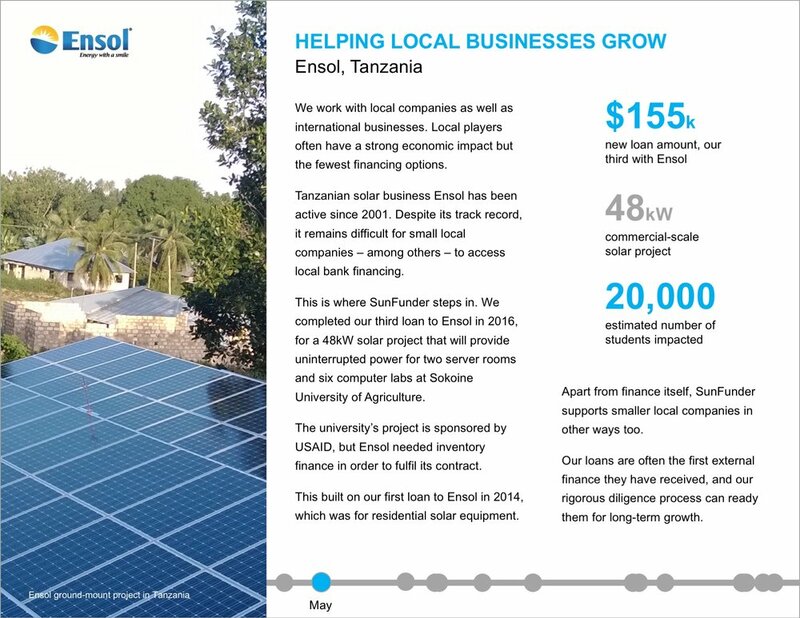 We work with the leading businesses in beyond the grid solar – while also providing finance to early stage companies that will become the next generation of leaders. Our loans range from inventory finance and working capital to structured receivables financing and larger commercial projects. Click on the case studies below to see some of our 2016 transactions. SunFunder unlocks capital for solar beyond the grid. We offer investors diversified, high impact, fixed-income debt products, comprising portfolios of emerging market solar investments. 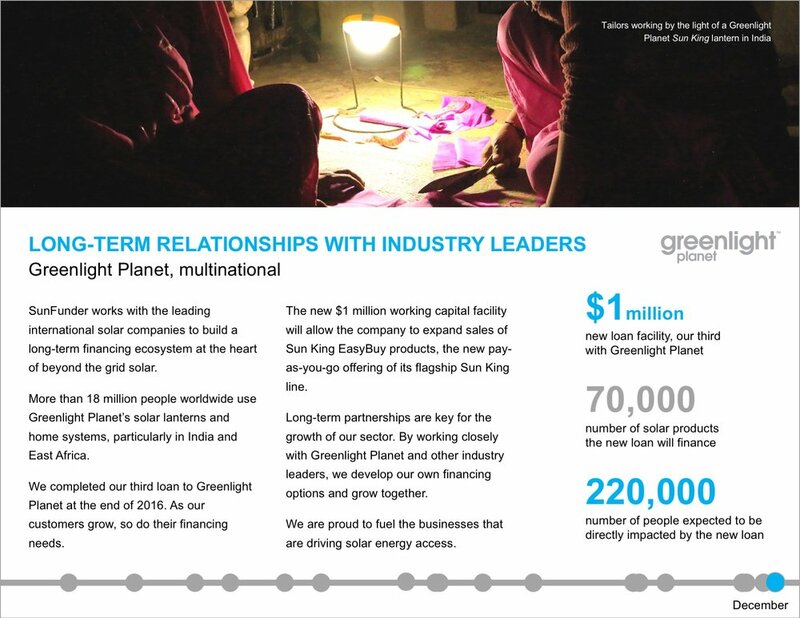 We started 2016 with $15 million of debt funds, and ended it having raised that to $39 million through our new Beyond The Grid Solar Fund. The sector needs an entire ecosystem of investors to fulfil its potential – from well-targeted concessional finance to commercially-oriented capital from impact and institutional investors. We pioneered the role of financier as aggregator and intermediary for our sector to bring this ecosystem together. The opportunities we offer investors are proving its long-term viability. We closed $24 million of the Beyond The Grid Solar Fund in 2016. The first close, in October, was anchored by OPIC, The Rockefeller Foundation and MCE Social Capital. They were followed by Baldwin Brothers and the Sant Foundation. We are thrilled to have them as partners – and are actively engaging with investors to complete the $50 million fund and unlock further capital in 2017. SunFunder loans go directly to financing the companies and projects delivering solar to people living beyond the grid. There are 1.2 billion people with no access to electricity, and another 1 billion people with only unreliable access, primarily in Sub-Saharan Africa and India. Solar power now offers an economic solution, which a range of entrepreneurs are proving can be delivered commercially, through highly scalable business models. They need finance to grow. The result is children having light to do their homework by. Households no longer reliant on toxic and dangerous kerosene – and saving money in the process. Rural businesses that can stay open after nightfall. New jobs in fast growing solar companies. In short, an entirely new energy economy – and a clean development pathway for a large part of the world’s population. The fundamentals of emerging market solar will keep improving: global energy access remains inadequate, fossil fuel dependency is expensive and solar keeps getting cheaper. New applications in new and existing markets will continue to present opportunities. We expect competition to increase in the sector as a whole, as new players enter and incumbents seek new markets. This also applies to the financing landscape, as more investors are drawn to a growing market. The beyond the grid solar sector had an unusual start in attracting both significant equity investor interest and concessional capital from development institutions. Increased competition will drive efficiency and new business realities. These all mean that demand for growth capital will increase. Climate funds and other development finance will mobilize at scale, leveraging in increasing amounts of commercial capital as transaction sizes and the industry’s track record grow. Financial intermediaries like SunFunder will play a prominent role in matching supply to demand. Operating in emerging markets carry specific risks. The industry is highly exposed to local currency fluctuations, but the majority of its growth has been in comparatively stable economies in East Africa. We are likely to see wider macroeconomic and other political risks emerge as solar reaches new markets. If 2016 was a breakthrough year for SunFunder, the year ahead is already shaping up to be bigger and busier than ever. Over the next three years we want to finance over $250 million of beyond the grid solar projects, and improve energy access for more than 30 million people. In 2017, this includes more structured finance transactions for pay-as-you-go and other solar receivables, more commercial-scale projects, and expansion into new markets. As the needs of the sector evolve, so do the partnerships we need to help it grow. We recognize the demand for local currency financing options, and will be launching the capability to offer this to our customers. SunFunder will also partner with other debt finance providers on syndicated transactions. We are looking ahead to our next series of debt funds too. By the end of the year we aim to have unlocked $50 million of new capital. SunFunder is also building new partnerships to unlock new kinds of institutional capital for beyond the grid solar.